Tell me which gods you worship and I’ll tell you who you are. In another chapter of the book El Sacrificio Humano I’ve been reviewing, Marie Areti-Hers, the author of the article on human sacrifice in the Toltec-Chichimeca culture, says that “to penetrate” into the Mesoamerican world one must take into account the complex statue represented by the last incarnation of that world, the “Summa Theologica locked in the formidable images of Coatlicue” (page 241). The Spaniards placed Our Lady of Guadalupe, the symbol of Catholic Mexicans, on the Hill of Tepeyac. But what the authorities conceal from the Mexican schoolchildren is that precisely on that hill the Aztecs used to worship their goddess. And what a goddess…! A picture is worth a thousand words. The below photograph shows a stone representation of almost 9 feet high of the Aztec goddess that you can see at the Museum of Anthropology when you visit Mexico City. 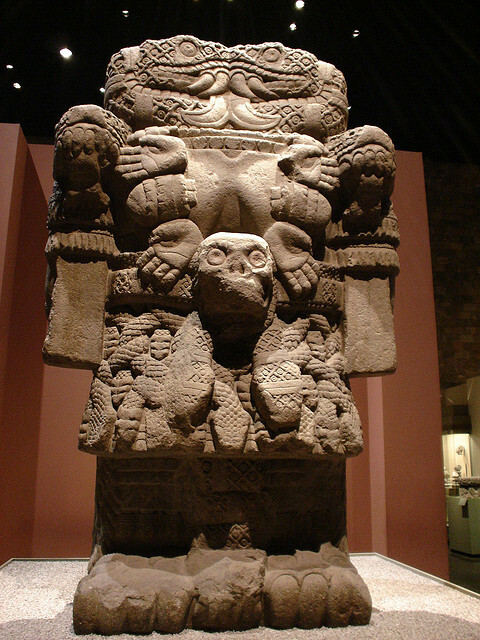 The Coatlicue is always represented with a skirt of interwoven snakes (nahuatl: Coatlicue, coatl, snake; cueitl skirt). See her collar consisting of a skull flanked by mutilated hands and hearts; her two large snakes that by kissing each other form a hideous face because the goddess’ children had decapitated her and the original face of the mother is missing. See also the phallic snake hanging between her paws like a third leg, paws which look as claws since, in the Aztec imagery, their favorite deity feeds from corpses. (In Tenochtitlan’s houses there were more figurines of the Coatlicue than of Huitzilopochtli, the male god of the Aztecs.) This goddess that devoured human hearts and blood was also the goddess of fertility and of the sacred earth. The above image has lost its color. How had the statue made its impact when painted with the most violent colors (see the Aztec Calendar above, also of stone) in the pre-Columbian temple? Her aspect was so terrifying that Amerind women entered the shrine headed down to avoid making eye contact with the monster while offering her beautiful flowers. And not just flowers… As I say in my book, it was said that to placate such goddess sacrifices of juicy infants were needed. No wonder why the Spaniards chose the hill of Tonantzin-Coatlicue, which used to house the formidable statue, to impose the image of the Lady of Guadalupe they had copied from the Spanish Virgin with the same name. Most Mexicans ignore that the name of the Lady of Guadalupe derives directly from Extremadura, homeland of many conquistadors including Hernán Cortés himself (info in Spanish including an image of the Spanish Guadalupana: here). The Mesoamerican had the concept of god and religion, but were very different from Abrahamic concepts. The Mesoamericans had a belief where everything, every element of the cosmos, the earth, the sun, the moon, the stars, which mankind inhabits, everything that forms part of nature such as animals, plants, water and mountains all represented a manifestation of the supernatural. In most cases gods and goddesses are often depicted in stone reliefs, pottery decoration, wall paintings and in the various Maya , Aztec and Mixtec codices. So? They still were “a culture of serial killers” as I say in my book. Their religion was clearly based on the “european religion”/paganism, the difference is,pre-columbian indians corrupted everything in the most disgusting,genocidal,anti-life cults,even though I despise christianity,it was the best thing that ever happened to the amerindians.